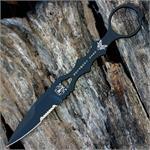 The Benchmade 178SBK-COMBO includes both Dagger & Trainer knives with a black sheath. Benchmade created the Special Operations Combatives Program (SOCP) 178 and was designed by Greg Thompson to give the troops in the field a means of transitioning from a close-combat edged weapon to a firearm without releasing the knife from their hand. 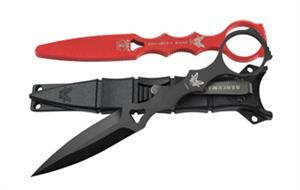 The 178 SOCP has a thin skeletonized dagger handle that make it easy to grab with either hand, and the ribbed loop provides extra control. The thin handle and finger loop also allow you to access and operate a handgun without having to transfer the knife to your other hand. The SOCP was designed with a slim design for easy concealment and a finger loop for quick access. A dull, unpointed training version is also available to aid in learning the proper deployment of the weapon. Completely MOLLE compatible, the SOCP sheath covers the dagger up to the ring making it very difficult for anyone other than the owner to grab it.